Unfortunately, there is a lot of bad news in the media about the health of the planet and our collective ability to clean it up before irreversible damage is done. Droughts and wildfires are getting worse; water is increasingly scarce; many species of plants and animals continue to march towards extinction. The situation is critical and the world needs solutions. Governments and politicians can only do so much when it comes to finding solutions to problems like climate change, species loss, and water scarcity. The innovations needed to address the challenges we face might only be solved through entrepreneurship and businesses making a shift in the way they measure their own success. Can a business be truly successful in the 21st century if it makes a profit but does so while destroying the planet? The consensus is increasingly ‘no’. Real success in business is being measured by financial performance as well as environmental and social outcomes. This is the change we need to see. Loudspring recently released a document that outlines the methodology and literature we use to measure the impact of our portfolio companies. This is the first year we have released such a document and the reason for doing so was to provide transparency to our stakeholders but also to provide a guide to other businesses who want to begin measuring impact themselves. As a team, we are almost 20 year veterans of climate technology and this is our 3rd year communicating our impact as Loudspring. This is important work for Loudspring as it is linked directly to our mission of saving natural resources. But for me, this actually isn’t the first time I have worked on communicating impact. It has been many years since I first begun working with impact reporting, which started with Proventia Group. In fact, in 2003 we won the award for best Sustainability Report. A lot has happened since, but with this perspective and experience, I am convinced that environmental concerns and impact are getting more and more important, even if everyone does not yet share this view. The climate crisis is real and the solutions Loudspring grows can and will be part of the difference. From our experience, we know that a lot of people share our vision. If you are in a position to influence the direction your company takes when it comes to understanding impact, then I highly recommend that you download our methodology and literature review document and discuss it with your colleagues. 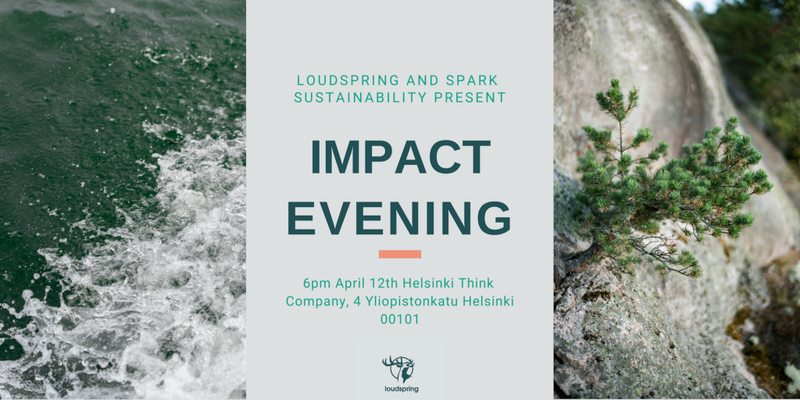 Loudspring and Spark Sustainability are actually hosting an Impact Evening on the 12th of April in Helsinki to launch our Impact Results for 2018 and also hear from a number of keynote speakers in the impact field. Business needs to be part of the positive change the world needs and understanding impact is the only way forward. Link to the document can be found here.